This is the original version of the Sinn 356 which is fitted with an acrylic cover in keeping with the historic German flieger design. This is one of the best selling Sinn watches in the entire line, and is noted for its clean design and easy readability. Automatic winding mechanical chronograph movement with power reserve of 42 hours. Functions include hours, minutes, subsidiary seconds, date, day and complete chronograph functions. Case is in sand-blasted steel with solid case back. Other features include screw down crown with protective horns, screw in back and water resistance to 10 ATM. When you purchase your new Sinn watch from WatchBuys, you'll not only get a finely engineered timepiece with excellent value for money, you'll also benefit from the WatchBuys Sinn Advantage. Because we are the official and authorized North American Sinn distributor, your name and watch serial number will be automatically registered in our database for a Sinn manufacturer's limited warranty which we pass through. This means that should your watch require service during the Sinn manufacturer's limited warranty period, service will be provided by Sinn in Germany when you return your watch to them. This Sinn manufacturer's limited warranty is transferable to subsequent owners as allowed by Sinn. You are responsible for paying the shipping charges to Sinn, and all repairs that Sinn approves under its warranty are at no charge. Sinn will also pay the return shipping charges to the address you specify. As an added benefit to those who purchase Sinn watches from WatchBuys, you may choose to have your warranty repairs serviced through our US service center, RGM Watch Service located in Mount Joy, Pennsylvania. This added service saves our clients the time and effort of returning their watches to Germany for repair. This benefit is transferable to subsequent owners who purchase directly from the original registered owner. Please note that you are responsible for paying shipping and insurance charges for sending your watch to RGM. Once they reach your watch in the service queue they will determine which repairs are covered under Sinn's warranty. It is important to note that oil-filled quartz Sinn watches must be repaired in Germany (EZM 2, Hydro and UX series). If your watch meets one of these conditions and requires service under warranty, please contact us and we'll provide instructions for shipping the watch to Sinn in Germany. Your watch will be repaired at no cost to you other than shipping charges to either Sinn or RGM during the warranty period. Sinn watches purchased through the "grey market" (non-authorized sources) may carry no warranty from Sinn. Sinn watches purchased through authorized overseas retailers are governed by the warranty policies of those dealers and/or Sinn, and typically must be sent to either the overseas dealer or Germany for repair. You'll be wearing your new Sinn watch soon after your order is placed since we stock Sinn watches and ship free using FedEx Air. Plus, since we are located in the United States, there are no "hidden charges" for shipments to US residents as is the case with most overseas dealers. Such charges can add up to 15% to the cost of your new watch, and include credit card surcharges, foreign exchange credit card bank fees, import duties and taxes, and custom's broker charges. WatchBuys offers a comprehensive return policy with no restocking fees to US residents. Overseas dealers, including those involved in the grey market, typically don't offer a return policy, and if they do, returning a watch under the policy is both complicated and expensive due to import/export and custom's requirements. Restocking fees are also common and may range up to 15%. Learn more about our return policies. WatchBuys is pleased to accept payments through PayPal, debit and credit cards. We charge no surcharges to use credit or debit cards, and because we are based in the United States your US card is charged in US dollars with no conversion or exchange rate fees. We also accept payments from PayPal and charge no surcharges. Please note that to pay by credit card, debit card or PayPal your account and/or card must be issued by US or Canadian financial institution and billed to a confirmed US or Canadian address. When you purchase your new Sinn watch from WatchBuys, you'll earn WatchPoint Rewards which accumulate and may be redeemed against future purchases. Verified Owner Comments: After receiving my Sinn 356...I have to say it looks stunning in person. Being it’s a 38.5mm one would think it would be on the small side but having a thin bezel and being a chronograph it’s quite pleasing to wear on my 7.25 wrist. The dial has a timeless design and is quite legible for a chronograph. I love the look of the acrylic crystal and even though the acrylic crystal can get scratches (can be buffed out) there is something about the way a domed acrylic crystal captures the light and distorts the numerals...very cool! Overall an amazing looking chronograph and would recommend the Sinn 356! Verified Owner Comments: And easy process. Had the ship date pushed back a day with no issues. Watch is amazing. Verified Owner Comments: Watch is beautiful. Regularly receive comments. the face is a bit small, but the watch has presence on the wrist. Sharpe, purposeful, and handsome look. Wears well with both casual and dress attire. Reserve battery tends to last about 36 hours for me. Every week my watch seems to be -5 seconds or so, but this really isn't much of a concern for me. Would highly recommend for someone looking for a handsome and quality watch that no one you know will have heard of or owned. Was a bit hesitant to buy a watch without seeing it or knowing anything about the seller (watchbuys). Couldn't be happier with the process. Received a call promptly after ordering the watch and a rep went over critical details with me. Very transparent and easy to work with. Immediately alleviated my concerns. I will not hesitate to shop with them again. Verified Owner Comments: I really like the look of this watch. My first watch with a Hesalite crystal. It adds a nice effect when looking at the dial. Performance so far has not been as good as I hoped. Seeing +10-15 s/d. Hoping it will improve. Chronograph is working great. Most of my watches are larger but this watch wears bigger than I thought it would. I was also considering the 358 Diapal but liked the classic look of the 356. Verified Owner Comments: I've worn the 356 for three weeks and I'm really enjoying it. This is my first Sinn and first chronograph. I have a small wrist and the 38.5 mm case is perfect for me. It’s keeping incredible time and I strongly urge you to not avoid the acrylic crystal model. It's lovely. Verified Owner Comments: I'd been pining for the Sinn 356 Flieger Acrylic on a strap for a couple of years. Meanwhile, I watched it go through a couple of $100-price increases. So I finally decided to spring for it and, now that I have it, I couldn't be happier. First off, it's a perfect fit for my 6.5 wrist. Second, I thought that Sinn's replacing the Valjoux 7750 with the Sellita SW500 was going to be a deal-breaker for me, but so far the Sellita actually out performs the chronograph I have with a 7750. All in all, I'm very satisfied with my purchase. And, both Rob and Kevin at WatchBuys were very helpful, attentive, and responsive to my pre-purchase inquiries about the 356. Verified Owner Comments: Such pleasure doing with Watchbuys. I love my Sinn 356. It is such a classic watch and Ive been wanting for ages. Extremely comfortable to wear on the leather strap. Equally at home on a nylon G-10. I love everything about this watch. Verified Owner Comments: The Canadian customs and duty were very expensive and added lot to the price of the watch. The watch itself is very nice and is extemely accurate. The finish is very beautiful and I am very happy with this watch. I replaced the black strap that came with it with a vintage leather brown strap also made in Germany. The quality is the best. Verified Owner Comments: The buying experience from Watchbuys was one of the most pleasant that I have had. Communications was excellent and the watch was delivered as promised. The Sinn 356 is a beautifully made watch and has been averaging 6.5 seconds per day over a week. I have had some trouble resetting the chrono, however, when the minute counter is in the 13-16 minute range. Not big enough a problem for me yet to return it for service, would hate to give it up that long. Overall the watch is a great classic chronograph and suits me perfectly. Verified Owner Comments: I was torn between the Sinn 356 and the Damasko DC56. After doing some research, I opted for the Sinn with its classic profile. It's a gorgeous watch, and sized just right. It has presence without being ostentatious. The materials Damasko uses may be better, but the look and feel of the Sinn 356 is, in for my money, the better choice. And the good people at WatchBuys could not have been more helpful. "Sinn 356 Is Perfect Everyday Watch"
Verified Owner Comments: This watch is the perfect timepiece for any occasion. It's sporty and dresses up pretty well too. I ordered it with the rubber strap and I've worn it nearly every day for the past month. I wasn't expecting to like as much as I do, but it's a great watch. Keeps accurate time as well. 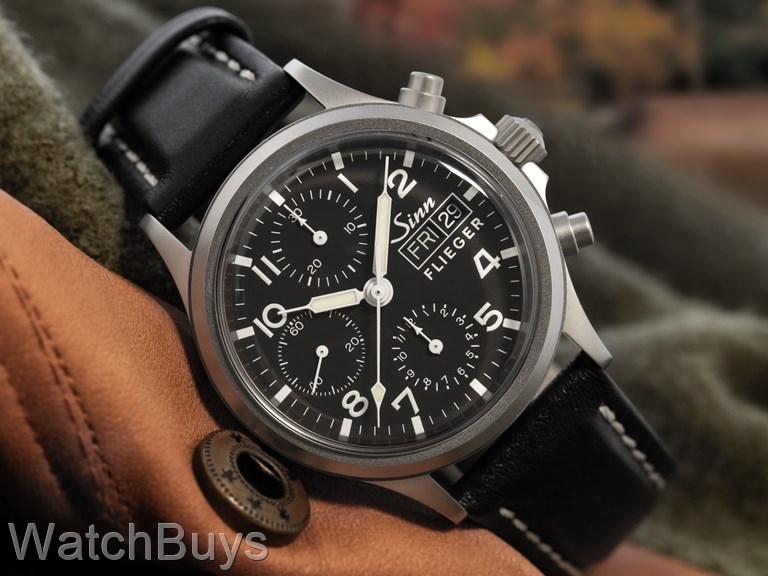 Verified Owner Comments: I have always been a Flieger fan, and I love this Sinn 356 due to its styling and size. 38-40mm is the sweet spot for my 6.5 inch wrist. Great build quality and the acrylic really gives it a vintage period look. The watch arrived carefully packed in a non-descriptive package for security. I am very happy with this purchase and would do so again. And thanks to Rob at Watchbuys for his quick and helpful email response (on a weekend)! Verified Owner Comments: A very beautiful and classically designed piece. Timeless. Perfect size, with good height. But the acrylic is what makes this. It's amazing. I love this watch. Verified Owner Comments: My Rolex Sub and my Omega SeaMaster have not been worn. The Sinn 356 is much more accurate. Wish I had found Sinn before purchasing the Rolex or the Omega. Sinn watches feature a number of cutting edge technologies, many of which are unique to Sinn. Please note that not all Sinn watches, including the watch on this page, use all of these Sinn technologies. Many Sinn watches are fitted with Tegimented cases produced in-house by Sinn's case making affiliated company in Glashutte, Germany. Standard steel used by most watch companies has a hardness of between 200 and 240 HV (Hardness Vickers is a common scale used to measure material hardness). The Tegiment process produces a hardness of at least 1,200 Vickers which is five times harder than standard steel (and on some Sinn models up to nine times harder than standard steel). The Tegiment process is not a coating consisting of a foreign material; instead the steel itself that has been hardened using a special engineering process that creates a hardened barrier. The base material is a type of stainless steel also used for surgical implants, and the stainless steel resistance to corrosion is further improved by the Tegiment hardening process. The primary advantages to a Tegimented case are extreme resistance to scratches and other case abrasions, as well as increased resistance to corrosion. Please note that certain Sinn watches are fully Tegimented (case, bezel) while others are Tegimented only on the bezel. Use the links below to view both categories. View Sinn watches with fully Tegimented cases. View Sinn watches with Tegimented bezels only. A number of Sinn models feature cases filled with inert gas. Sinn has found that filling the case with inert gas can help prevent the introduction of moisture and humidity to the case, as well as provide a more stable environment for the oils that lubricate the movement. The proper care of any mechanical watch movement mandates that these oils maintain both their viscosity and lubrication properties. View Sinn watches with dehumidification technology. A number Sinn models use one or more copper sulphate capsules to absorb humidity trapped inside the case. Over time these capsules will gradually turn dark blue indicating that humidity has been absorbed. The primary benefit to these copper sulphate capsules is a more dry and stable environment for both the movement and the lubricating oils. Together with Sinn's inert gas treatment these capsules form the basis of Sinn's Dry Hold Technology. This technology not only provides a more stable environment for the movement, but also prevents fogging of the crystal when going from hot to cold environments or from humid to non-humid conditions (such air conditioned buildings). View Sinn watches with copper sulphate capsules. Magnetism can cause dramatic swings in the timekeeping of a mechanical watch movement. People are often exposed to magnetic fields without even being aware - frequent high altitude flying, metal detectors, audio and video equipment, medical equipment and computer equipment can all cause problems with magnetism. Many Sinn watches offer extreme protection against magnetism up to 80,000 A/m. Sinn achieves these results using a number of different technologies, including special case and case back construction, soft iron components in the case and protective rings surrounding the movement. View Sinn watches with extreme antimagnetic protection. Sinn caused quite a stir when they first released their DIAPAL technology. Beginning in 1995, Sinn began work to create an oil free escapement. With any mechanical watch movement, the aging of oil, especially in the escapement can create long term problems for that movement. Additionally, as movement oil ages, required service intervals become more frequent. Sinn's early analysis to this problem provided a quick solution (at least in theory) - if you don't use oil, it can't age. The process began by exchanging the ruby escapements for diamonds (the word "DIAPAL" derives from the German name for diamond escapements) in order to achieve the desired effect. The designation stuck, even though today Sinn works with solutions taken from advanced nanotechnology rather than diamonds. The result is a movement that proves so reliable that Sinn offers an unprecedented five year warranty on their DIAPAL watches. View Sinn watches featuring the DIAPAL oil free escapement. Sinn has developed a technology termed "Hydro" in which the entire watch case is filled with oil. Watches using this technology are based on quartz rather than mechanical movements. By using this type of movement, Sinn is able to fill the watch with oil, which has the joint affect of greatly enhancing the readability of the dial and time from any angle (including under water), and increasing the water resistance of the watch even at great depths. View Sinn watches with Hydro Oil Filled technology. Sinn has created a line of watches featuring cases made from German submarine steel (the U Series). The steel was procured by Sinn from a steel supplier to Emden GmbH, one of Germany's North Sea shipbuilding yards who construct submarines from the very same steel. Because of the special steel used from the submarine steelmanufacturer, the case resists the effects of exposure to salt waterand salt water environments. These cases are produced in-house by Sinn's case making affiliated company in Glashutte, Germany. This special steel is also amagnetic which means that is does not have magnetic properties and cannot itself become magnetized. The watch movement itself is protected from magnetic fields up to 4,800 A/m. View Sinn watches built from German submarine steel. Sinn is a partner for manufacturing watches for the German Special Forces, including SWAT, Customs, FBI, helicopter police, GSG9 and other units. Beginning with the now highly collectible (and valuable) Sinn EZM 1, Sinn has grown this collection to some of the most durable and highly functional watches made and they remain among the most popular in the collection. View Sinn watches in the EZM Series. Lothar Schmidt, Sinn's CEO and owner had long been disturbed by a lack of technical standards for defining a "pilot's watch". As an engineer, Mr. Schmidt was fluent in standards for diver's watches, anti-magnetic watches and the many other technological standards used to manufacture watches. A widely used reference for standards is DIN, or the Deutsches Institut fr Normung (German Institute for Standardization). Oddly, he discovered there were no DIN standards to cover pilot's watches where such standards existed for example for diver's watches. The new "Technical Standard for Pilot's Watches" (TESTAF) was developed by the Aachen University of Applied Sciences and establishes the suitability for professional use as a pilot's watch.